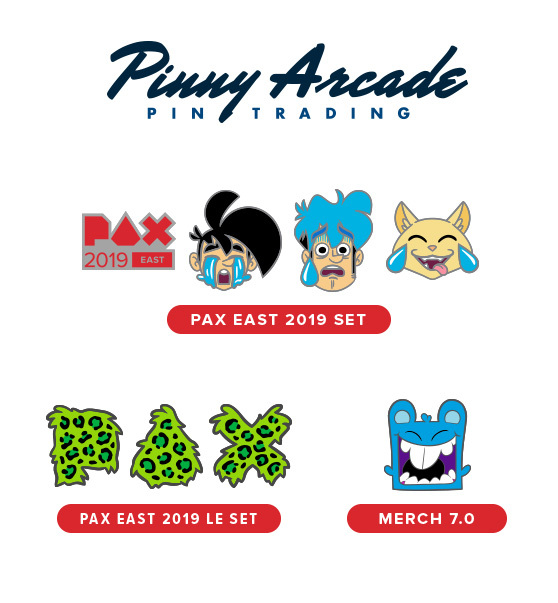 Penny Arcade - News - PAX East 2019 Pin Quest! Available for purchase at the Finji booth #16108. Available for purchase at the Ysbryd booth #18108 or complete the demo of WORLD OF HORROR and receive this free pin from the game. Available for purchase at the Ysbryd booth# 18108. Collect at least three tokens by participating across various activities at the Facebook Gaming booth #15055. Share Stories in the official Instagram photo booths with #FacebookGaming, meet with Gaming Creators, and experience Oculus to collect tokens. Available at the Brace Yourself Games booth #21109. Available for purchase at the Berzerk Studio booth #16104. Available for purchase Headup Games booth #23078. Follow Indie MEGABOOTH on Twitter or Instagram (@indiemegabooth) and post 3 selfies of yourself in front of 3 different game booths featured in our spaces (MINIBOOTH or MEGABOOTH). 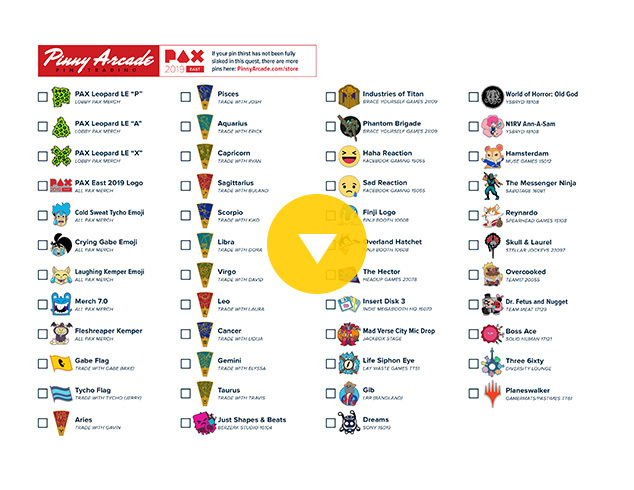 Include @indiemegabooth & #IMBPAXEast19 in whatever you say along with your post. Show us your post(s) at IMB HQ/booth #16070 and you’ll get a $5 discount off our pin! Limited discounts/supplies per day, first come first serve! The Insert Disk 3 pin is also available for purchase. 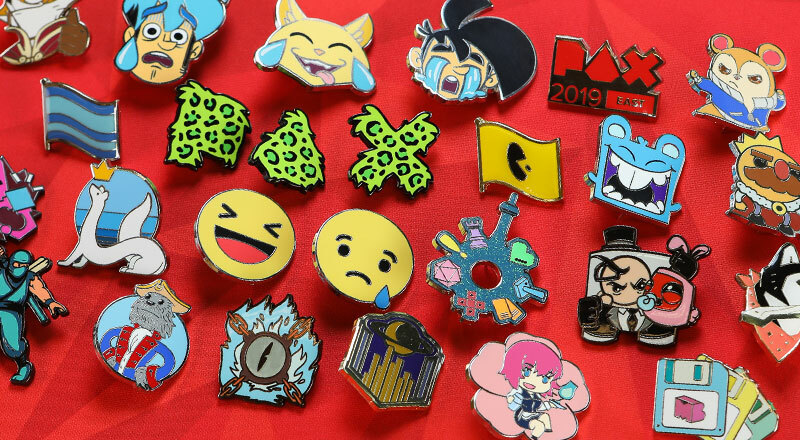 Win a game at the Jackbox Stage to get a pin, or you can get one the easy way by purchasing one. Available for purchase at the Lay Waste Games booth #TT51. Compete at the Sony booth #16019 for a chance to win a Dreams Pin. Try your hand at the limited game challenges throughout the day to get a pin or you can purchase it the Muse Games booth #15012. Available for purchase as at the Sabotage booth #16081. Available for purchase at the Spearhead Games booth #15108. Available for purchase at the Stellar Jockeys booth #23097 and get a discount with a completion of a demo. Play any two games at the Team17 booth #20055 to receive a pin. Available for purchase at the Team Meat booth #17129. Available for purchase at the Solid human booth #17121 or be a Blobageddon Tournament Finalist. Available for purchase in the Diversity Lounge. Available at the Official PAX Merch Booths located in the Expo Hall and the Lobby. ONLY available at the Lobby PAX Merch booth. Available at the Official PAX Merch Booths located in the Expo Hall and the Lobby with any purchase of $100 or more. 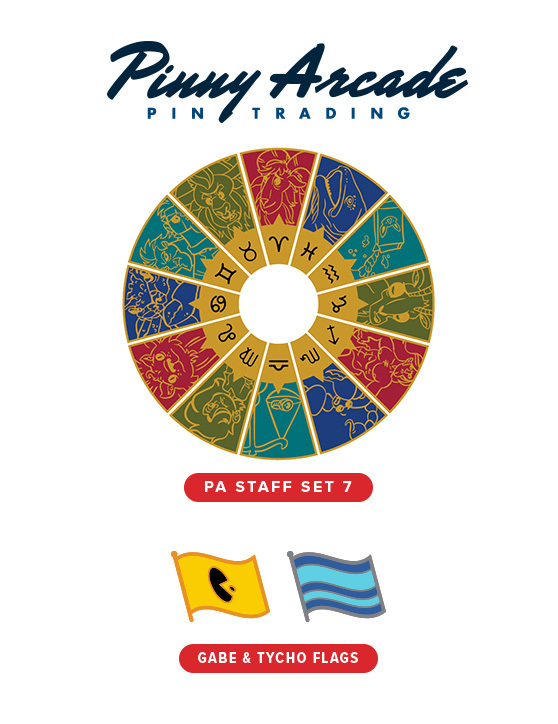 Trade with Penny Arcade staff members for their Staff Series 7 pins.